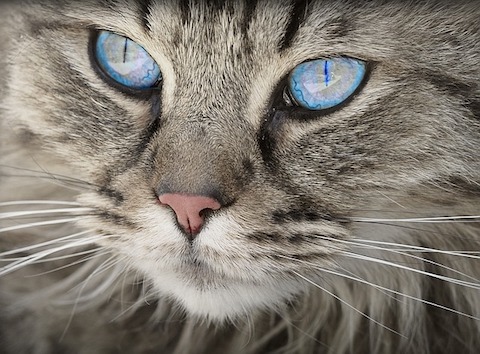 We answer some of the common questions about cats, as well as debunk some of the myths. Today’s post is definitely one for cat lovers. How long have you had a cat? Maybe you just got one, or you have had one for years now, either way, you might have questions. When you look at a cat, it looks like they hide many secrets that you wish you could figure out. Despite being such popular and adorable pets, there’s a lot that’s still mysterious about them. In today’s article we attempt to understand cats a little bit more by answering some of the most commonly asked questions about them. Why does your cat lick you? We’ve all been there. One day, you’re just minding your own business when suddenly, your cat jumps up and begins to lick you. You begin to wonder if they are tasting you to see whether they want to eat you or maybe they just think you’re dirty. Humans don’t do that to each other, so why do they do this? Vets are divided as to why exactly cats lick humans, but they have noticed a common denominator. A cat will only lick you if they like you. This has led them to believe that cats will only lick you if they feel safe around you and love you. 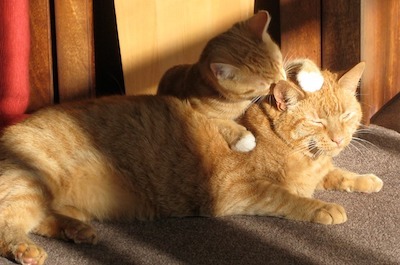 Cats lick their loved ones to help groom them and it is a sign of affection among the felines. When your cat trusts you, they will try and help groom you. It is a sign of love and trust. Cats are wary, curious creatures that take their time about things. It might take them a little while to trust you, but when they do, they will lavish you with love and attention. Well, that, and they might be checking to see if you taste good or not. There is nothing more difficult than trying to give a cat a bath. It is a well-known fact that cats hate water. If, on the off chance, your cat likes water, then you can move on to the next question. Why is it so hard to give cats a bath? Isn’t it supposed to be one of the most pleasant experiences ever? Most dogs like getting a bath, so what is up with cats? Cats groom themselves several times every day, they also don’t hesitate to lick dripping faucets. But they won’t get into a bath. This is because their fur is not designed to get wet. When you put a cat in a bath, their fur becomes very heavy and your cat becomes uncomfortable. They were not expecting this, and it might feel strange and a little scary. Another reason is because cats are sensitive to certain smells. Some vets theorize that the chemicals in tap water makes cats wary of water. And a third reason is because cats are cautious creatures. They were not expecting to be put into a bath full of water and they do not like unexpected surprises. If you have ever had to get out of bed early, while your cat was sleeping peacefully, you probably wished you were a cat. Cats do get a lot of time to sleep, and they seem to enjoy it. Why do they spend so much of their time asleep? There are a few reasons why your cats always seem to be sleeping. Cats are natural predators, this means that they are most active during the night; this is when they really come alive. You are probably asleep when they are awake. Your cat will be most active between dusk and dawn, which might explain why your cat is always sleeping when you’re around. In fact, your cat might be wondering why you’re always asleep! When your cat is awake, they make the most of their time. Your cat will spend time running after prey or playing with friends. They are incredibly active and wear themselves out. They need to sleep more to save energy for when they are awake. Think cats are fast enough to make it on our list of the fastest animals? What about a cheetah? Find out here. A lot of cat toys have catnip in them. And if you have ever given your cat one of those toys, you know how crazy it makes them. You might have been curious and tried some yourself, but it did not have the same effect on you. So, why do cats like catnip so much? First of all let’s explain what exactly catnip is. It’s a plant that belongs to the mint family. It has purple and white flowers and has a pungent smell that some cats go crazy for. Catnip belongs to the mint family and can be used when cooking. The leaves and the stem of this plant contain an oil named “nepetalactone.” When cats smell the oil, it causes their receptors to produce pheromones. These pheromones allow the cats to feel an overwhelming sense of happiness or euphoria. The effects can be compared to hallucinogenic drugs on humans. Catnip does not work on all cats, and kittens and older cats are not affected in the same way. 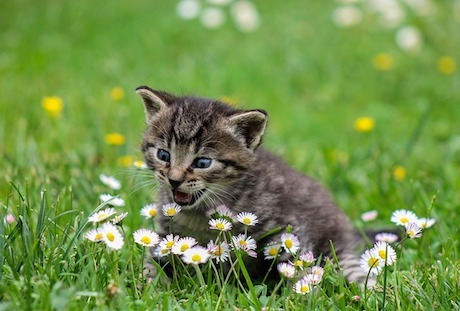 Some breeds do not react to catnip at all, and scientists have discovered that the reaction to catnip is hereditary. If a cat’s parents went crazy for catnip, the cat will also go crazy for catnip. They also found out that bigger feline species react to catnip too. If you’re ever close to a lion and have some catnip on you, it might save your life. A while ago a certain funny cat video started popping up on YouTube. Instead of featuring the cuddly fur-balls doing silly and oh-so-endearing things, we got a chuckle for a different, more cruel reason – the cats shown in them were apparently scared half to death, and if anyone ever measured how high cats can jump it wouldn’t be at all surprising if some of those frightened felines managed to get really close to the record. Why were the cats so terrified? Cucumbers! Whether they were the long kind you’d use in your next salad or the smaller, pudgier ones that are best turned into pickles, there’s no denying that in each and every instance cucumbers were to blame for the cats’ alarmed (and admittedly hilarious) responses. What is it about this humble elongated vegetables that strikes terror into the hearts of normally brave animals? We’ve decided to take a closer look and see if there’s a rational explanation behind it. If you fire up one of the dozens of compilation videos that are already available on the subject, the first thing apart from cucumbers you can see the clips having in common is the scene that plays out – the cat is usually enjoying their meal or a well-deserved treat. Then at one point it spins around, takes a look at the offending cucumber and does its best to get as far away from it ASAP. Notice how the cat never sees the cucumber beforehand, and is otherwise engaged in something like feeding which obviously takes up its full attention at the time? That’s one of the key elements of understanding the joke, and more interestingly, cats’ ingrained behavior as well. The single most important factor to solving the mystery of cats’ fear of cucumbers is actually the element of surprise. Felines are cautious creatures, genetically predisposed to be solitary, silent and deadly. While you wouldn’t know it by looking at your chubby tabby that’s lounging on the sofa for most of the day, cats still retain most of the predatory instincts we get to see in action from their bigger brethren while watching nature documentaries. Among the most refined is the instinct for self-preservation. The cat will do anything in its power to make sure that there’s no competition around to contest its food. Only once it is satisfied that there is no danger afoot can the cat drop its guard and start eating. In the jungle or on the dusty savannah, there’s a plethora of sounds and smells which would alert the cat to any changes and let it know what it may be up against. In the modern home however, it’s easy for the domestic cat to get caught up in munching away at its favorite tuna-flavored cat food as the likelihood of being attacked by something bigger and stronger than itself has consistently proven to be zero. That’s what the owners are inadvertently exploiting when they’re placing the insidious cucumber traps! Some of the aforementioned cat videos give us the final piece of the puzzle – the cucumbers are placed behind the cats only AFTER they’ve started eating, and the owners do so as noiselessly as possible to escape the cat’s notice. This creates an unusual situation with what turns out to be a deeply ingrained response – once it turns around, the cat has a split second to notice the sudden and unexpected change in its surroundings. The cucumber is something it didn’t expect, and to err on the side of caution its instincts take over, making the cat jump up in alarm and surprise, a response that’s designed to get the cat out of harm’s way immediately and save it from would-be attackers. So why cucumbers? Honestly, the fact that people are using cucumbers to scare their pets isn’t all that important. If you had a sadistic streak and wanted to try the prank out yourself, placing any other object the cat would not expect to find there would probably be just as effective. Some animal behaviorists have theorized that cats associate the long thin shape of a cucumber with that of a snake. Does scaring your cat like this have consequences? Alright, so you’ve had your laugh at others’ cats’ expense. What’s done is done. Do yours a favor though and please don’t consider pulling the same prank on it just to see if it works. It most likely will, but are you willing to essentially torment a cherished pet just to get a few extra laughs out of a joke that’s just about run its course? Apart from being a pretty mean thing to do to your cat, scaring it like this, especially if you keep doing it, can have a lot of serious consequences for the cat’s mental and physical health. Cats need to feel safe and secure while feeding. If the cat senses that it can’t eat in peace, it may choose to stop eating altogether. After a few days, the lack of nutritional intake can cause it to develop what’s known as fatty liver disease. If not addressed by a veterinarian immediately, this disease can cause the cat’s liver to fail and for it to die in the worst case scenario. A timely intervention will thankfully help the cat towards complete recovery, but all the fear, drama and medical expenses can be easily avoided. Even if you know better than to try this joke out, there’s a useful takeaway for you to consider – cats are very much creatures of habit and they don’t take kindly to their routine being disrupted, especially when it’s done in such an invasive way. If you want your cat to stop being afraid of something or get used to changes in your home, introduce the cat to these changes gradually and let them decide how they want to approach them on their own. After they’ve had time to adjust, the cat won’t be stressed or scared anymore. So toss that cucumber back into the fridge and show some love for your furry friend instead. Cats are mysterious creatures. Many people misunderstand them. But when you realize that cats are cautious but curious animals, you get to know a bit more about them. They go crazy for catnip because it smells amazing to them. They don’t hate water, they just hate being dunked in water. If your cat licks you, it means that they love and appreciate you. And your cat does not sleep all the time, it is just active when you are asleep. If you’re still in the mood for reading then check out our latest articles on Redbubble and Nickelback. Follow KnowMoreStuff.com on Facebook to see informative posts on a daily basis.